Let’s just be clear here that everyone involved in this incident is awful, with the exception of that dog. 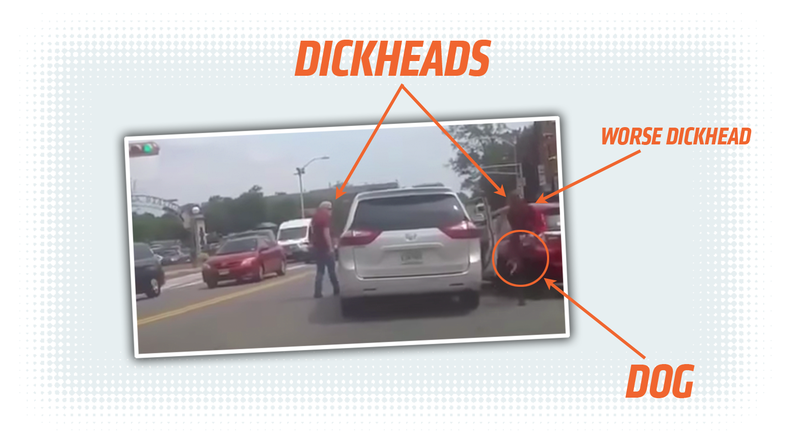 It’s not clear what predicated this messy, embarrassing, idiotic and ultimately cruel display of road rage in Montclair, NJ, but it ended with a dog being flung out of a car and possibly injured. The incident happened on Bloomfield Avenue in Montclair, and video of the event was uploaded to the internet yesterday. It’s not clear exactly when the event itself occurred or who was involved, but Montclair Police is investigating. A witness’ dash cam video shows an altercation between the driver of a white or maybe silver Toyota Sienna minivan and the driver of a red Honda Fit. Who the hell knows what sparked the fight, but it’s very physical, with the older Toyota driver shoving the Fit driver, initially falling himself and then flinging the other guy back towards his Honda. You’d think two guys with such similar taste in shirt color could get along better. The Toyota driver then returned to his van, presumably to leave, when the Honda driver, taking a little vacation from anything that resembles human decency, opens the Toyota’s door, grabs the man’s small dog, and flings it onto the street. The Honda driver then drives away; the dog had run back towards the two cars right before he leaves, so it’s possible the dog was struck by the fleeing Honda. One of the witnesses says things that suggest perhaps the dog was injured, but it appears that the dog is fine, and the SPCA is investigating the incident. This whole thing just makes canines seem a lot better than humans. 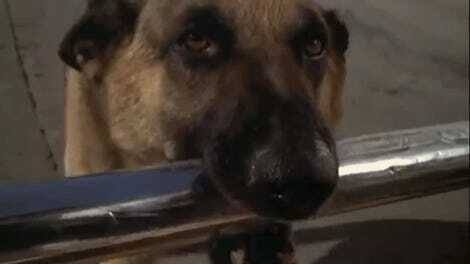 EDIT: For some reason, I thought the guy on camera yelling “Samantha!” was saying “It’s a mad dog!” Oops. Language is a funny thing, sometimes.